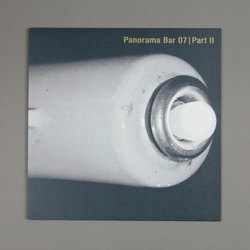 Various Artists - Panorama Bar 07 Part 2. Vinyl 12. Bleep. The Panorama Bar mix series strikes back for its 7th installment with club veteran and psych- house maestro Andreas Baumecker aka nd_baumecker. A Berlin and Panorama Bar resident since 2004, Baumecker’s sets have long been known to heads as a foundational part of the club’s identity: deep, unpredictable, funky, bassline-heavy, melodic, and seamless flowing between different rhythms and key-changes. As a producer, Baumecker’s studio focus (with Sam Barker in Barker & Baumecker) sits comfortably between pop, dancefloor and spiraling left field electronics; on top of two LPs and numerous EPs on Ostgut Ton, the duo have also remixed the likes of Vessels and shoegazers Ride. But Baumecker honed his musical sensibility not only through DJing and studio work, but also as a buyer for famed Frankfurt record store Delirium (founded by Ata and the late Heiko M/S/O), as well as an in-house booking agent for Berghain / Panorama Bar. This composite identity as a selector, collector, club curator and musician feeds heavily into the diversity of Baumecker’s 120-minute vinyl-only mix – including the six exclusive tracks over two 12”s. On Panorama Bar 07 | Part II, Ross From Friends’ “High Energy” delivers from the get-go via driving saturated drums and heady, lo-fi atmospherics, followed by Dave Aju’s lush electronic tropicalia “Wayahed”. The final track belongs to Dutch duo Duplex, who deliver big with “Isolator”, propelled forward by unpredictable claps, snares, open hats and multiple melody lines in a deceptively complex arrangement – made to sound easy. As the exclusive tracks imply: nd_baumecker’s Panorama Bar 07 mix hedges no bets with bold melodies or rhythms, focusing more on groove and depth than genre. Full tracklisting to be announced.